Occloud 9 > Company News > Cloud Solutions and Disaster Prevention…How will you protect your business? 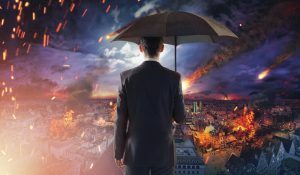 Cloud Solutions and Disaster Prevention…The year 2018 has been plagued with numerous catastrophic disasters. The devastation to lives and property and businesses is disheartening. Devastating wildfires in California have taken out entire towns, or left thousands unable to return home, as recently as today. Shopping centers were left to burn in Paradise, California. Earthquakes and Tsunamis destroyed parts of Indonesia. Hurricane Michael nearly wiped Mexico Beach, Florida off the map and the effects of Hurricane Florence will haunt North Carolina for years. Many more events have occurred but the purpose of this reminder is to engage your fears. What if YOU or your company were affected by any of these events? How would you be working? Could you work? Would your business crumble? Could you survive the wave of uncertainty? If you cannot answer yes, it’s time to consider moving your business into a Cloud Solution. Be proactive – be prepared! In the face of disaster protect your business with OCCloud9’s Cloud Solutions. OCCloud9 can help give you peace of mind that if disaster were to strike this very minute, your invaluable company data and intellectual property would be stored securely out of harms way so that you can sleep well at night. Some businesses have a disaster recovery plan in case of an emergency, yet those plans should be revisited to adjust with the ever-changing world of technology. On-Site and Tape Backup is obsolete, just as storing valuable data locally on a physical server or someone’s desktop is a major disaster waiting to happen. With traditional means of Data Recovery, you have backups, media stored on-site, redundant systems, physical PC’s and getting all these systems up and running again is very expensive and can take up to 72 hours before a working environment can be restored. Three days may not seem like a long time, but think of lost or delayed sales, missed deadlines, possible regulatory fines. This could have a profound effect on your business and bottom line. Is this something that keeps you up at night? Cloud Solutions can help give you peace of mind in the face of disaster. The advantages of cloud computing is undeniable. Businesses and organizations are reaping the benefits of turning to private cloud and virtual desktops. OCCloud9 offers 24/7 support, can custom tailor your environment to your specific needs. With virtualizing your desktops you can be confident that you are at the apex of DR preparedness. Your data is continually backed up and synchronized at a secure remote location which means backup and restore is now much simpler. If the next disaster affects you, rest assured that your data is protected. Your company can pick up and employees can log into the company server using their virtual desktop. Everyone can still access their data and work applications even if they can’t make it to the office or if the building is no longer standing. They can log in and work anywhere with virtually any device as long as there is an Internet connection. Contact us to explore the many different cloud solutions OCCloud9 has to offer and how we can provide you with greater business continuity in the event of disaster. Rest assured your data is protected, contact OCCloud9 today! Alex is the Chief Cloud Officer and Managing Partner at OC Cloud9, Inc.. His innovative thinking about the future of IT Solutions Providers pioneered the launch of OC Cloud9 as a sister company to Orange County Computer, Inc.. Alex likes to run a fun yet productive work environment which has contributed to the innovative solutions our tech team has designed over the years. "We're just a different breed of Techs over here", claims Alex, "and our clients can attest to it." Each client is unique and it's our responsibility to educate them about the vast benefits of using cloud solutions.